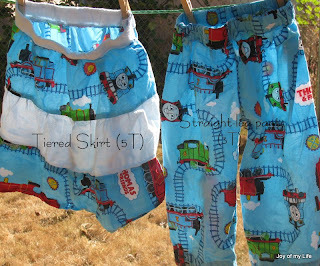 Nothing new about these projects... Oggie loves Thomas and Friends™. Ana never cared for Thomas until Oggie started liking them. Just another way to compete with him for his toys, looks like. Anyway, Oggie wanted Thomas pants and rather than buying them, I decided to make one for him. I had enough fabric leftover for a tiered skirt for Ana as she insisted she loves Thomas too. If I don't indulge them every once in a while, when else can I, right?! Tiered skirts are fun. Ana has a few I've made over the last couple of years. For the skirt: Cut a 4-inch or 5-inch wide strip say roughly 1½ times the measurement of the waist for the first tier; then, for the next subsequent ones, make them potentially 1½ times the previous tier. Twice or 2½ times would naturally make a fancier, fuller skirt. A simple sort of running stitch by hand or basic machine stitch helps make the gathers - simply pull the thread and adjust the gathers to fit the circumference needed. These pants are my preferred style for boys and girls - elastic waist for easy-on easy off and straight wide leg so easy to slip out of even when wearing shoes.